Pipe Dream Archives Binghamton men’s basketball head coach Tommy Dempsey will retain his position next season. 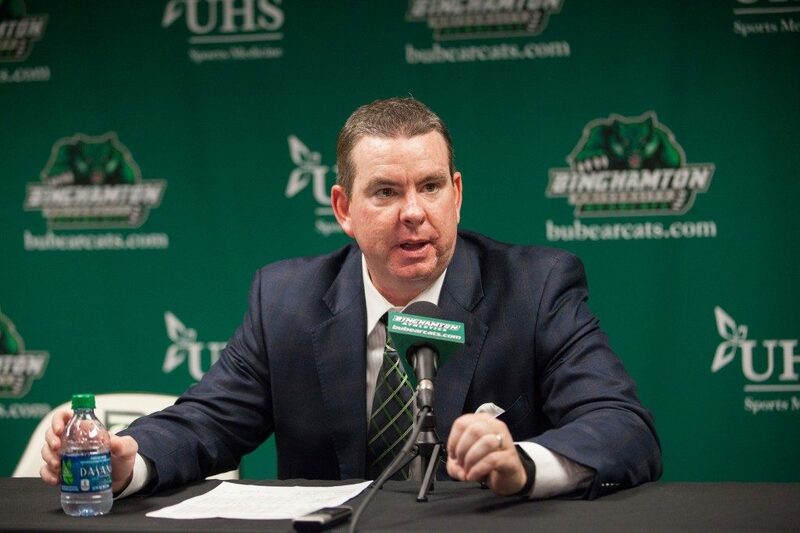 Binghamton men’s basketball head coach Tommy Dempsey is said to have been told on Wednesday that he will remain the team’s head coach a day after its season-ending 71-54 loss to Albany, according to a report from Jon Rothstein of CBS Sports. With Dempsey at the helm, the Bearcats (11-20, 2-14 America East) have gone 47-137, including just 20-75 against AE opponents. He has one year remaining on his contract. The Bearcats will be the only one of nine teams to miss the conference playoffs this season. BU’s match against the Great Danes (22-9, 10-6 AE) was closer than the final score indicated for much of the contest, but Albany’s second-half push widened the gap and allowed them to ease their way to the victory. The game was largely meaningless for both sides for their place in the conference standings. The Bearcats had already been eliminated from playoff contention after Saturday’s loss to Hartford, while Albany entered the night locked into the fourth seed of the AE Tournament. That left these in-state rivals to play for pride and bragging rights, as well as a chance for Binghamton to end a down year on a high note. Albany did not waste much time getting to work offensively. The Great Danes poured in 29 points in the first 10 minutes of play, including a 21-6 run that put the Bearcats in a 12-point hole. Albany moved the ball well during the stretch, accumulating six assists. The Bearcats went on to find their stride in the later stages of the half, chipping away until a small run put them down eight at halftime after being down by as many as 13. Senior forward Willie Rodriguez, in his last game in a Bearcat uniform, put up 14 first-half points on six-of-nine shooting to lead the charge. “[Rodriguez] kept us in it in the first half,” Dempsey said. The Bearcats came out of the locker room looking to build on their momentum from the end of the first. Taking advantage of a couple of Albany turnovers, Binghamton cut the lead all the way down to two points. In total it was a clean 11-0 run for the Bearcats that spanned parts of the two halves. The success didn’t last, however, as Albany’s dominance returned, following a timeout by Great Danes head coach Will Brown. Albany began to convert its shots, while the Bearcats started to miss theirs. Rodriguez, dominant in the opening period, scored only two points after halftime. Binghamton shot 34 percent from the field in the second half, and was abysmal from beyond the arc for the entire game. Toward the late stages of the game, Albany truly started to pull away, led by graduate student forward Alex Foster, who began to take over the game. Foster finished with 15 points, 10 rebounds and four blocks, most of which came in the second half. He was all over the court, including on a play where he flew in for a put back dunk directly off a missed 3-pointer — one of 12 offensive boards for Albany. All of that contributed to a large deficit for Binghamton that carried through to the final buzzer. Rodriguez led all scorers with 16 points, while junior guard J.C. Show had an ineffectual 10 points on an erratic night from the field. The Bearcats were out-rebounded by seven on the offensive glass, and by 15 overall. From here Albany moves on to the AE Tournament, where it enters at the fourth seed, earning itself a home game for the first round. The Great Danes’ first-round matchup will be against fifth-seeded Stony Brook, who didn’t play on the final night of the regular season and enters with a few days of extra rest. Picked to finish sixth in the AE Preseason Coaches’ Poll, the team finished last. Dempsey remains optimistic about the direction the program is headed.